Tripod turnstiles offer a cost-effective, fast operating, easy to use, reliable entrance solution for internal or external use in areas where there is a large and constant flow of people. Our extensive range of fixed and drop-arm tripod turnstiles, manufactured by Automatic Systems and Essence provide a visual barrier to unauthorised visitors and meet all the aesthetic requirements needed for corporate reception areas. We can supply either manually operated or motorised mechanism. 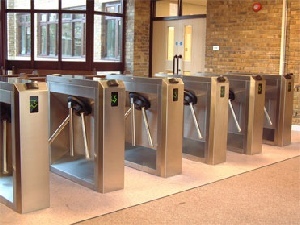 Unlike the manually operated turnstile, motorised versions offer a drop-arm mechanism which automatically re-engages. This means that you do not need to deploy staff to manually return the tripod arms to their operational position once the emergency has passed. The body of our tripod turnstiles can be compact, bridged (as standard), boxed, and supplied with a verity of different shaped end panels . All our turnstiles can be fitted with our revenue collection pods to create high security coin operated turnstiles ideal for public or private sector toilets. In applications which require DDA or wide access we offer a verity of different manual and automatic pedestrian swing gates.